Municipal worker at Bradford, England; born at Pyrmont, Germany, Nov., 1806; died at Torquay April 22, 1889. His father, removing to Hamburg in 1815, became a successful merchant; and Jacob began his career by entering his father's firm. In 1834 he left Hamburg for England and took up his residence in Leeds. Here he entered into business as merchant, and in a short time extended his operations to Manchester. In 1838 he finally settled at Bradford, and the history of the development of the worsted trade of that town is inseparably associated with his name. He took an active part in the municipal life of the town, was the founder of the Bradford Chamber of Commerce, and was regarded as an authority upon questions of tariffs and of commercial treaties. He was also an expert statesman, occupying himself in that capacity mainly with obtaining statistics on trade, the tribunals of commerce, the bankruptcy laws, and the Yorkshire Joint Tariffs Committee (of which he was president). Mr. Behrens appeared before a commission at Paris as a witness from the English worsted district, in reference to the commercial treaty with France. In recognition of his services on this occasion, he was knighted by Queen Victoria Oct., 1882. Sir Jacob was an advocate of free trade, and rendered much assistance to Richard Cobden in the intricate negotiations which led up to the French treaty of 1861. He was active also in philanthropic movements, held a prominent place in the Bradford Philosophical Society, founded the Eye and Ear Hospital at Bradford; and was a member of the Anglo-Jewish Association, although he took no further active part in Jewish communal affairs. 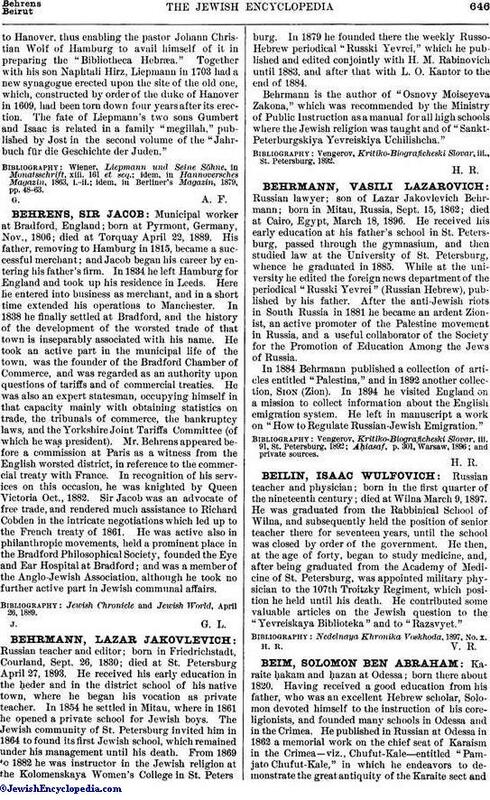 Jewish Chronicle and Jewish World, April 26, 1889.